Kitschy hens overlook the breakfast table. Sam considered the room where he entertained guests, the nest of the home. All photos courtesy of the Sam and Alfreda Maloof Foundation for Arts and Crafts. 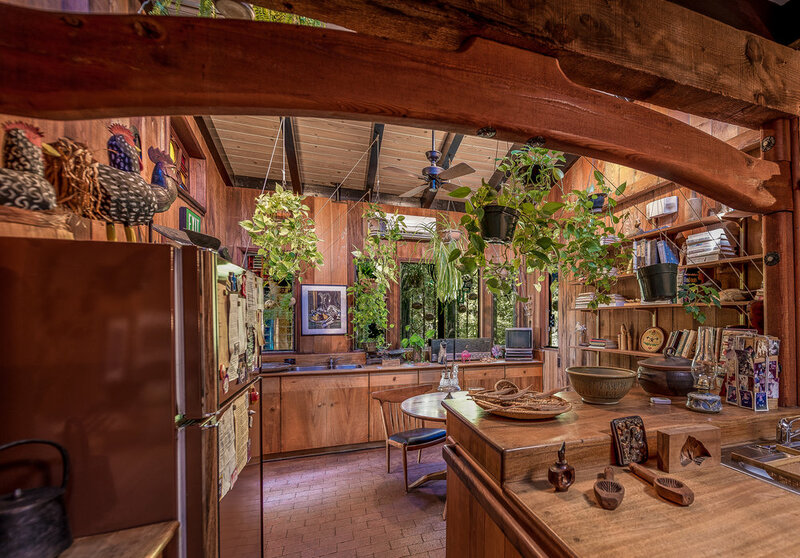 The home of renowned artists Sam and Alfreda Maloof, sits at the foothills of the San Gabriel mountains. The house mimics an art gallery while maintaining a welcoming lived-in feel. It features the work of friends and colleagues, as well as Sam and Alfreda’s own. The original Maloof residence was threatened during the construction of the 210 freeway. However, it was recognized as a national landmark and transferred to its current location at 5131 Carnelian St. in Alta Loma. Maloof was born to Lebanese parents on Jan. 24, 1916, in Chino, California. As a child, he showed interest in calligraphy, cartooning and graphic art, but had trouble deciding what to focus on. He later worked as an apprentice for the famous artist Millard Sheets, and married Alfreda Louis Ward in 1948. The couple moved to a house in Ontario where Sam built furniture out of his garage. 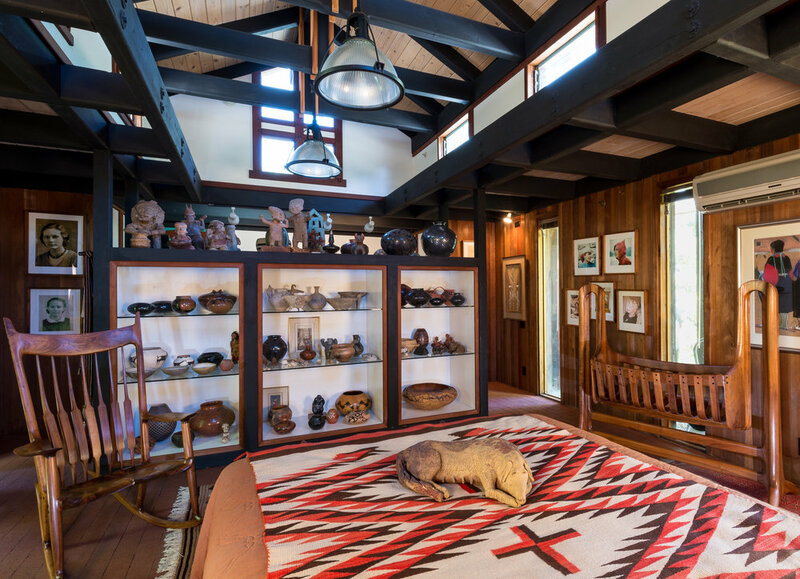 He sporadically added to the home that is now a museum for over four decades. The tour begins with a tall Japonesque wooden gate that leads to the front door. Once inside, shocking colored walls display artwork by Sam’s mentor, Miller Sheets. A blue door marks the entrance to Sam’s workshop, where handmade furniture is still being produced by his apprentices. Shelves are lined with books and knick-knacks that the couple collected from around the world. In the living room, a bright yellow mid-century couch displays a dip that indicates what could have been Sam's favorite place to unwind. In the dining room, a sleek extending table top protects oatmeal colored wool on seats that resemble benches. Pictures of the couple hang like timelines wherever onlookers turn. Worn, earthy bricks click and rattle with every step one takes. Singing bricks are what Maloof called his uncemented puzzle-like floor. 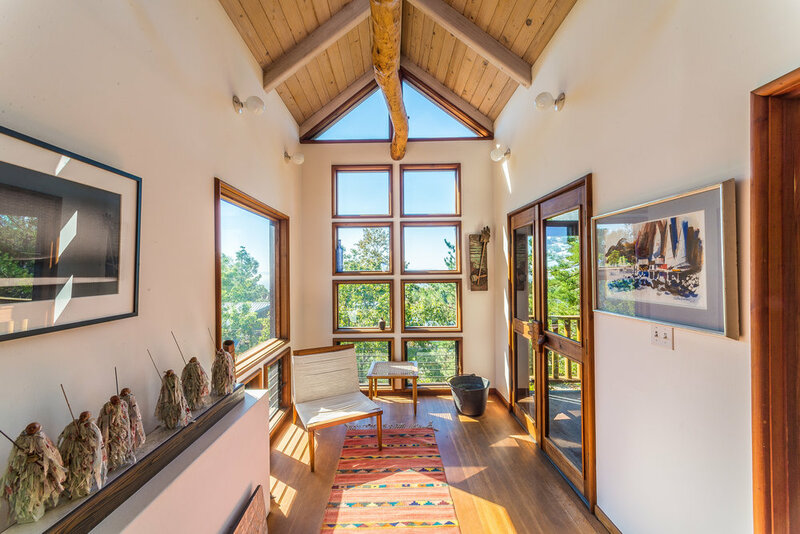 Rooms host bright woven Zapotec rugs that clash beautifully against unadorned walnut furniture and redwood walls. Oversized kitschy hens overlook a small round table and entertainment center in the breakfast nook. Sunlight creeps through the stacked glass blinds in Alfreda’s treehouse reading nook. The original room in Ontario hovered over an avocado tree so Sam made the old tree trunk a ceiling beam. Downstairs, the master bedroom showcases an off-centered bed with a missing headboard. A trick that Alfreda came up with to prevent Sam from reading or working in bed. 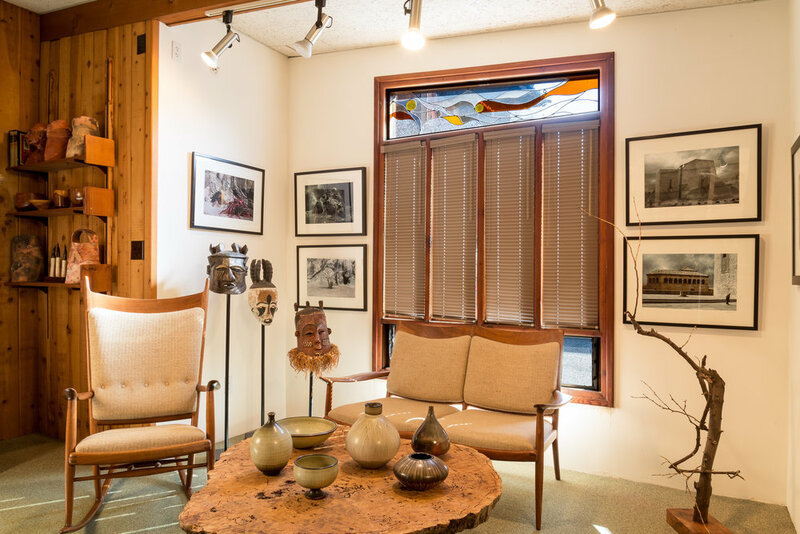 A combination of wood and bright stained glass displays Alfreda’s name above her studio door. 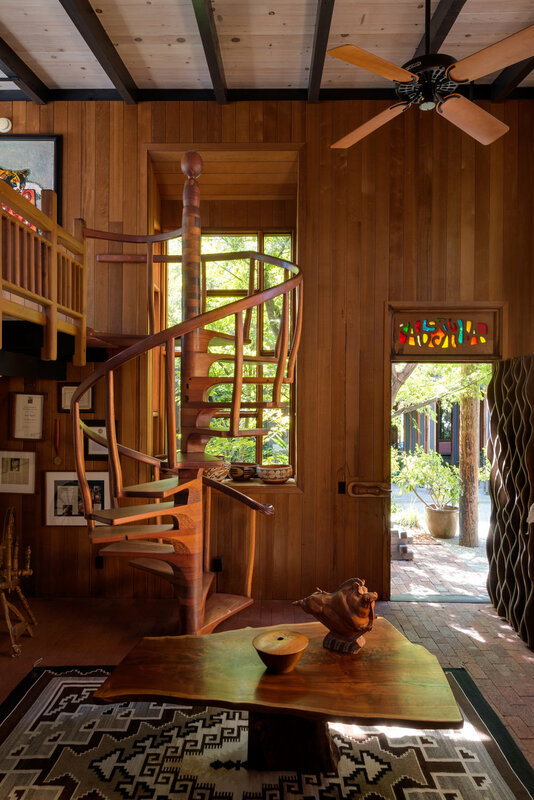 A carefully crafted wooden spiral staircase leads to the guest room above. The tour ends with a signature Maloof chair that guests are invited to sit on. Even at the height of fame, Sam declined the artist title. He preferred woodworker because he saw it as an honest word. Sam Maloof died on May 21, 1999, at the age of 93. His woodwork is appreciated for its fine and modern style and resides in museums such as LACMA, The Met, The Smithsonian and private collections all over the world.